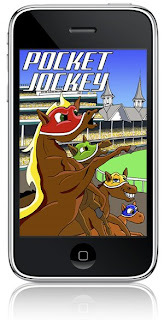 Warren Stringer has created a new multiplayer horse racing game Pocket Jockey for the iPhone and iPod Touch. Playing multiplayer Pocket Jockey is easy: all you need is a Wifi connection and a friend who has Pocket Jockey. The closer you gallop to the beat of the song, the faster your horse runs! An occasional whipping makes your horse go even faster. The game is available at the App Store for $.99.